Infection with Coccidioides immitis, a soil-dwelling fungus endemic to the American Southwest, may have protean manifestations in immunocompromised patients who reside in1 2 or who have travelled to3 that region. We report a patient whose abnormal PET/CT scan raised concern for recurrent lymphoma but instead was due to disseminated coccidioidomycosis. A 62-year-old woman was diagnosed with ileocaecal marginal zone lymphoma (MZL) after presenting with iron-deficiency anaemia and faecal occult blood. Ten years earlier, she underwent allogeneic haematopoietic cell transplantation for acute myeloid leukaemia (AML). She had recurrent cutaneous chronic graft-versus-host-disease (CGVHD); 50 months before the diagnosis of MZL, she completed a 9-month course of prednisone (50 mg every other day) and did not receive any further corticosteroid therapy. At the time of diagnosis of MZL, the patient was receiving twice-monthly extracorporeal photopheresis (ECP), which had been initiated 1 year earlier for the most recent flare of cutaneous CGVHD. She received regional 3D conformal radiotherapy, with a total dose of 24 Gy delivered over 12 daily fractions of 2 Gy. For 1 year after treatment of MZL, she also continued on ECP for CGVHD. PET/CT scans at 3, 6, 12 and 18 months post-radiotherapy were negative. However, a PET/CT scan 29 months post-treatment showed multiple fluorodeoxyglucose (FDG)-avid areas in the left upper and right lower lobes (standardised uptake value (SUV) 4.7 and 9.4, respectively), right infrahilar region (SUV 17.3), hilar (SUV 12.0), retrocrural (SUV 7.9) and para-aortic (SUV 8.9) nodes, and several vertebral bodies (SUVs 6.3 to 6.9) (figure 1). 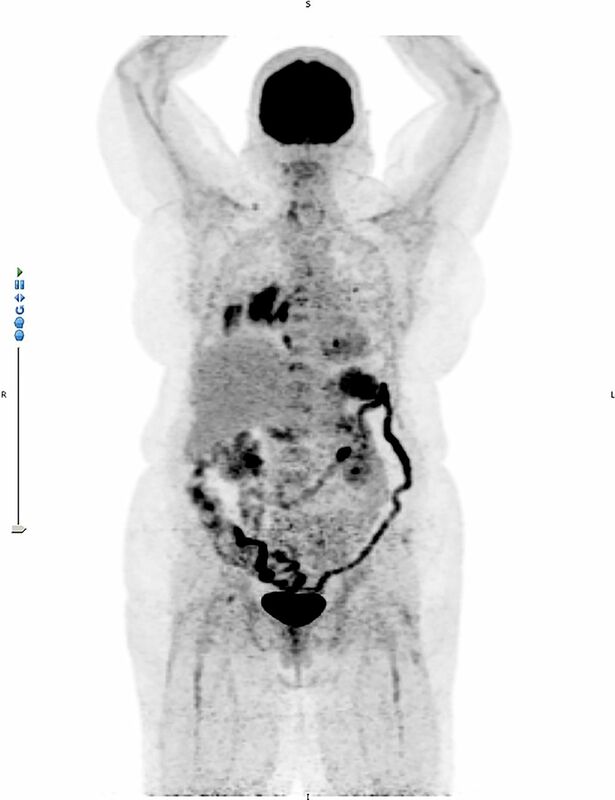 PET/CT scan 29 months after local radiotherapy for marginal zone lymphoma, showing new fluorodeoxyglucose-avid intrathoracic and extrathoracic adenopathy, left upper and right lower lobe masses, multiple vertebral body lesions and splenomegaly. Because these findings were suspicious for recurrent lymphoma, the patient underwent a CT-guided biopsy of the right lung mass, which showed haemorrhagic tissue and acute and chronic inflammation but no granulomata, organisms or malignancy. On additional questioning, the patient recalled a remote history of possible coccidioidomycosis; she had lived in Arizona, USA, for more than 30 years. Serological studies for Coccidioides showed positive IgG and indeterminate IgM by enzyme immunoassay; further quantitation with complement-fixation titres was not performed. The patient began treatment with oral fluconazole (400 mg daily) for disseminated coccidioidomycosis. Eight months later, a PET/CT scan showed resolution of FDG-avid areas (figure 2). The patient completed a 12-month course of fluconazole and has had no recurrences of coccidioidomycosis, lymphoma, AML or CGVHD. 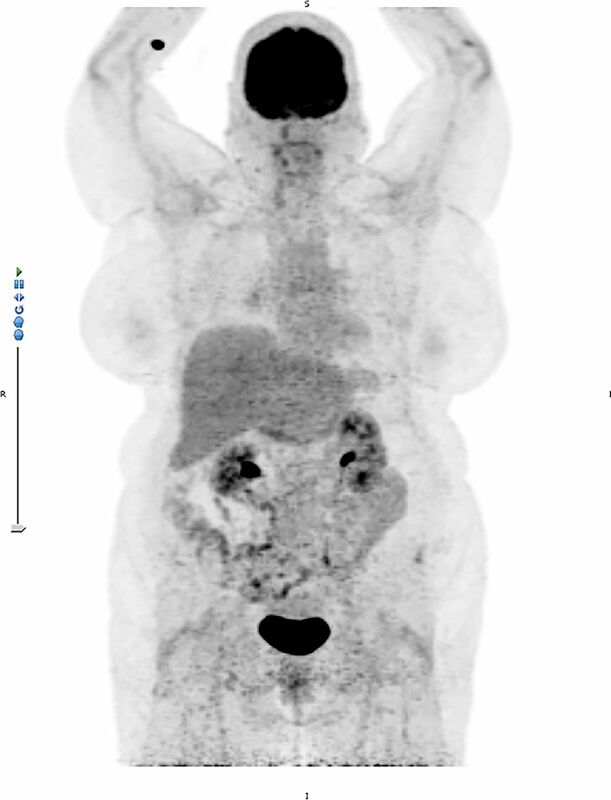 PET/CT scan after 8 months of treatment with fluconazole, showing complete resolution of fluorodeoxyglucose-avid lesions. Disseminated coccidioidomycosis is a protean disease that can be confused with fluorodeoxyglucose-avid malignancy. When evaluating either immunocompromised or immunocompetent patients with medical imaging studies that suggest pulmonary and/or skeletal manifestations of a disseminated or focal neoplastic process, one should obtain a thorough history of residency in or travel to regions where Coccidioides is endemic. Contributors MAM and AMY conceived and planned this report. PHK assisted with acquisition and interpretation of images. All authors contributed to the writing and editing of this report.